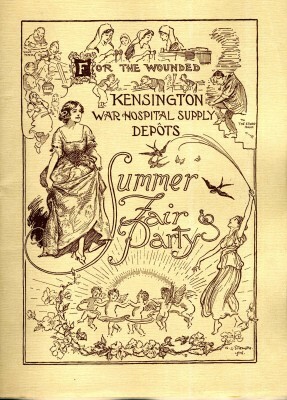 Located on the east and south side of Kensington Square at no’s 11, 12, 13 and 13A, the Kensington War Hospital Supply Depot operated from January 4th 1915. 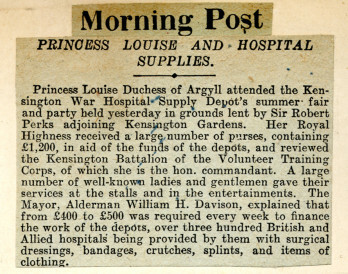 The depot assisted in the distribution of ‘hospital dressings and requisites of all descriptions’, including bandages, swabs, bed tables, cruches and splints. The flyer really highlights the volume of demand for this medical service, with over 45,000 articles made per week. The depot was described in a 1917 supplement to “Punch” as ‘a power for good’ with ‘ingenious adaptability’ shown and ‘quiet efficiency’ in the production of vital materials. This Summer Fair Party was held to draw attention to the activities of the depot and encourage volunteers. The depot expanded to no. 5 Kensington Square in 1918 and in later years became known as the Surgical Supply Depot.